Masayuki Miyata was born in Tokyo. Miyata became a book designer and illustrator for Charles E. Tuttle Co.
Miyata produced Tuttle’s winning entry in the 6th Annual Book Jacket Competition in the United States. Challenged with having to create an appropriate design for a book on Chinese cooking, he happened upon the little known ancient Chinese art form of paper cuts, called kiri-e in Japanese. Miyata helped found Kodansha International. During this period, Miyata predominantly created woodblock illustrations, including those featured in “Earless Hoichi,” and “Taro the Dragon Boy.” He was later personally requested by Junichiro Tanizaki to illustrate several of his books. From this year onward, Miyata concentrated on kiri-e exclusively. Soon his works began appearing in weekly magazines such as Shosetsu Gendai, Shosetsu Shincho, Shukan Asahi, and Shukan Bunshun. Collaborating with Donald Keene on Keene’s book “Bunraku: The Art of Japanese Puppet Theatre,” Miyata designed the title page. 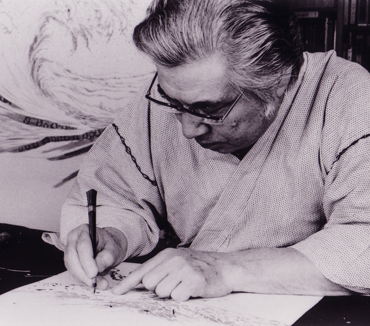 Miyata embarks on the formidable undertaking of creating a kiri-e interpretation of the “Genji Monogatari Emaki” (Picture Scroll of the Tale of Genji), a National Treasure of Japan. This picture scroll is an illustrated depiction of the “Genji Monogatari” (Tale of Genji), the most famous work of Japanese literature and the oldest novel in the world. In this landmark year for Miyata, he was awarded the Kodansha Publishing Cultural Prize and had his first book, a monochrome collection of his kiri-e titled “The Collection of Masayuki Miyata Volume I,” published. In the spring of 1973, Miyata took part in his first overseas exhibition. Bringing together three Japanese artists, the “Japanese Art Exhibition,” was held in Hawaii to introduce traditional Japanese paper art to Americans. The publication of “The Collection of Masayuki Miyata Volume II,” complete with color illustrations, was followed in November by Miyata’s first one man show in Athens, Greece, at Gallery 13, the oldest and most prestigious gallery in Athens at the time. During this year, Miyata’s works were exhibited at several museums in Brasil, including the Museu de Arte de Sao Paulo, the Museu de Arte da Prefeitura de Belo Horizonte, and the Museu Nacional de Belas Artes de Rio de Janeiro. Eight of his works were acquired for the collections of several of the museums. In September, Miyata presented His Holiness Pope Paul VI with another kiri-e, “The Camellia, Taroan,” in celebration of his birthday. The exhibit “The Black-Haired Beauties of Japan,” was held at Matsuzakaya art galleries in major cities. Miyata presented the Shitenno-ji Temple with his work “Shotokutaishi-zo.” “The Beauties of Masayuki Miyata,” was published by Kodansha. The Museu de Arte de Sao Paulo presented the exhibit “The World of Masayuki Miyata: Japan,” commemorating the 70th anniversary of Japanese emigration to Brazil. Miyata was selected from among a company of international artists to have his work “Japanese Pieta,” included in the Vatican Museum’s Modern Religious Art Collection, making Miyata only the fourth Japanese artist to ever be so honored. In this year, a major exhibit was held at the Takashimaya galleries in Tokyo and Osaka in celebration of both the induction of Miyata’s work, “Japanese Pieta,” to the Vatican Museum and his 25 year career as an artist. Miyata’s consummated 54 piece masterful kiri-e interpretation of the “Picture Scroll of the Tale of Genji,” was exhibited at the main branch of Takashimaya in Nihombashi, Tokyo to celebrate the Centennial of the birth of the great Japanese literary figure, Junichiro Tanizaki. Miyata’s work “Fugaku-zu,” (A View of Mt Fuji) was accepted for inclusion in the China and Japan Art Collection of the Gutenberg Museum in Mainz, Germany. The museum acquired both the original kiri-e and a serigraph to go in its renowned print collection. Miyata’s illustrations of the famous haiku poet Matsuo Basho’s “Oku no Hosomichi” (The Narrow Road to Oku), an account of the poet’s reflections on life and journey through Japan’s northern regions, were serialized in the magazine Bungei Shunshu. In celebration of Miyata’s career, which had now spanned 30 years, the collection was exhibited nationwide as “The Narrow Road to Oku, 300th Anniversary Commemorative Exhibition.” Achieving wide public acclaim, these works, along with Miyata’s illustrations of “Warabe no Uta” (Children’s Poems of Japan), and “The Tale of Genji,” were published in book form. In celebration of the 1300th anniversary of the birth of Ganjin Wajo, the Chinese monk credited with introducing Buddhism to Japan, Miyata presented the piece “Ganjin Wajo-zo,” to the Toshodai-ji Temple. Miyata’s works from the “Man’yo Koiuta” (Love Songs from the Man’yo), the oldest anthology of Japanese poetry, were published and an exhibition held at Takashimaya’s main branch in Nihombashi. A special NHK TV documentary devoted to Japan’s traditional arts, “Itten Chukei: Tsukuru” presented “Kiri-e Artist Masayuki Miyata,” capturing on film the entire process of creating a kiri-e for the “Love Songs from the Man’yo” series. In February, six of Miyata’s works were chosen for a special exhibition at the Paris Biennale 100th Anniversary Exhibition at the Grand Palais. This was a great honor and the display of his works was the best attended of the entire exhibition. Miyata offered an original work “Ohka-zu,” to President and Barbara Bush. In recognition of his prolific 35 year career as an artist, the exhibit “The World of Masayuki Miyata,” was held at the main branch of Takashimaya in Nihombashi and Sogo Department Stores in Kobe and Hiroshima. Miyata was commissioned to create the title image and calligraphy for the NHK Taiga Drama (this weekly historical drama with an annual theme is NHK’s most successful and longest running series, having been continuously broadcast since 1963), “Hana no Ran.” In conjunction with the drama, NHK published the entire collection of Miyata's "Hana no Ran," kiri-e. The “Hana no Ran,” exhibit was held at Mitsukoshi galleries in Shinjuku, Ikebukuro, Sendai, and Sapporo, Sogo galleries in Kawaguchi, Osaka, Kobe, and Hiroshima, the Kintetsu gallery in Nara, and the Saikaya gallery in Fujisawa. Celebrating the 50th anniversary of the founding of the United Nations, Masayuki Miyata became the first Japanese ever appointed as the United Nations Artist of the Year, joining the ranks of world famous artists, Dali, Chagall, Miro, Warhol, and Ting Shao Kuang, who had been similarly honored in the past. Considered Miyata’s piece de resistance, the work Aka Fuji (Red Mt. Fuji), was chosen for a limited edition stamp that marked the opening of the “United Nations Summit for Social Development.” In Tokyo, a celebratory exhibition titled, “Kiri-e Neo-Japonism.” was held at Bunkamura the Museum. Miyata traveled to the Beijing Central Arts and Crafts University and Shanghai University Art Graduate School as a guest professor. Commemorating the 25th Year Anniversary of the Normalization of Relations between Japan and China, “The Return of Kiri-e, Miyata Masayuki Exhibition,” was held in Shanghai. Kodansha International published, “Kuro Kami Bijin Gasshu” (Black Haired Beauties) and an English version of Basho’s “The Narrow Road to Oku.” Heibonsha published “The World of Masayuki Miyata,” dedicating an entire issue of their special art magazine, “Bessatsu Taiyou,” to showcasing his works. Shanghai Teachers University invited Miyata to China as a guest professor. In recognition of his genius, the Chinese government officially granted Miyata’s kiri-e the title of Touseiga (Spirit of the Blade Art). During his return trip to Japan, Miyata suffered a sudden cerebral infarction and passed away on the fifth of January at the age of 70. In May, an exhibit of his amazing portrayal of the Chinese classics, the “Masayuki Miyata Memorial Exhibition: Shiki (Records of the Historian), Suikoden (Warriors of the Marsh), Todai denki (Legend of Heroes in the Tang Dynasty), and Sangokushi (Romance of the Three Kingdoms),” was held in major cities around Japan. As part of the ceremonies celebrating the 50th Anniversary of the founding of China, the Shanghai Library hosted the exhibit “Touseiga,” and held the dedication ceremony for the Miyata Masayuki Art Memorial Hall, which houses a permanent collection of his works. “The Masayuki Miyata Posthumous Exhibition,” was held in major cities throughout the country. Kodansha International published the English book “Love Songs from the Man’yoshu,” featuring his illustrations. The Nagoya Maruei department store held Miyata’s “Records of the Historian (Shiki), Warriors of the Marsh (Suikoden), Legend of Heroes in the Tang Dynasty (Todai denki), and Romance of the Three Kingdoms (Sangokushi),” exhibit, further celebrating the 30 year Anniversary of the Normalization of Relations between Japan and China. Heibonsha published “Masayuki Miyata: Records of the Historian, Warriors of the Marsh, Legend of Heroes in the Tang Dynasty, Romance of the Three Kingdoms,” to coincide with the exhibition, making Miyata the first and only artist to have had three volumes of this special art magazine dedicated to their works. In the spring, Miyata’s collected works from the “Records of the Historian, Warriors of the Marsh, Legend of Heroes in the Tang Dynasty, and Romance of the Three Kingdoms,” were exhibited at the Hanshin Department Store in Osaka. In October, celebrating the 25th anniversary of the signing of the accord normalizing relations between Japan and China and under the auspices of the governments of both countries, “The Masayuki Miyata Art Exhibit” was held at the National Palace Museum, making Masayuki Miyata the first artist ever allowed the honor of holding a one man exhibit within the walls of the Forbidden City, the former Chinese Emperor’s Palace. The reception, held at The Great Hall of the People, was attended by more than 200 Chinese and Japanese dignitaries and a commemorative printing of Miyata’s masterpieces titled “Touseiga: The World of Masayuki Miyata,” was published through a joint China-Japan collaboration. In commemoration of the 2003 exhibition at the National Palace Museum in Beijing, the exhibit, “The World of Masayuki Miyata,” was held exclusively at the Mitsukoshi stores in Nihombashi, Fukuoka, Osaka, Sendai, Chiba, Nagoya, and Sapporo. From January till the end of the year, Miyata’s masterpiece, “Black Haired Beauty” and several other works are being featured during the opening and closing credits of NHK’s Taiga Drama(NHK’s most successful and longest running serial, a year-long historical drama that changes themes annually and has run continuously for 43 years), “Yoshitsune.”　Masayuki Miyata's masterpiece, “Fuji Matsukaze” (Mt. Fuji, Wind through Pines) became the first foreign artist’s work included in the art collection of the Diaoyutai State Guesthouse, the site of the Six-Party Talks. The Diaoyutai State Guesthouse is a repository for the masterpieces of China's most exalted artists and “Fuji Matsukaze” was hung in the special Executive Reception Room, which is reserved for the use of the Chinese President and visiting Heads of State. The China Academy of Art of Hangzhou, Zhejiang Province, China’s most distinguished art university, established the Masayuki Miyata Research Facility and inducted Mrs. Shulei Ryu as a lifetime visiting professor and chairwoman of the research facility. Eight masterpieces of Miyata's that are held at the Shanghai Library Miyata Masayuki Art Memorial Hall were put on special exhibit at the Xian Museum's joint "Chinese and Japanese Kiri-e/Jianzhi" exhibition.